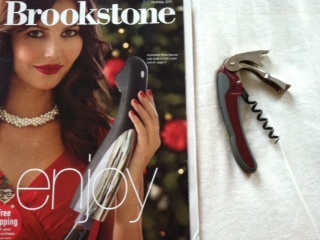 On the left, an advertisement for a Brookstone “Automatic Wine Opener with Built-in Foil Cutter”. Cost: $49.99. On the right, a classic pulltap corkscrew, which will run you approximately 10 bones, depending on where you shop (ask for a waiter’s wine opener, they are the best). Now if the fancy is what you fancy, by all means do what you do and rock that Rabbit, Rogar, or Brookstone. There are a number of ways to get a bottle open (including using a shoe, yes a shoe! ), but really, the pulltap is where it’s at- requiring just a slight amount of dexterous effort more than most alternatives. The little feeling of accomplishment experienced after opening a bottle of wine with a pulltap is unmistakable. Like wrapping a present or making a pie crust yourself- the result is a little more personal, a little more yours, a little more satisfying. Plus, the pulltap is quite portable (be a traveling party! ), and with the mula that you don’t spend on a crazy contraption you can buy yourself a lovely bottle, or two, or three.